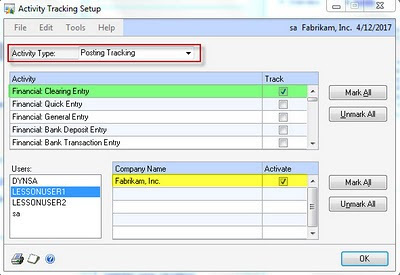 If you need to track certain user activities in GP such as master data creation or transaction posting activity, use Activity Tracking to do so. "Can you tell how to view the Dynamics GP security and access logs? We need to know who logged on and when they logged on." When clients ask this question, it is typically because they want to review the historical logs to research an issue. Unfortunately, by default, GP does not log security events or user activity, so the answer is usually that such data does not exist. However, for those clients (and diligent consultants) who are aware of the possible need for such logs, now is the time to consider the Dynamics GP Activity Tracking feature to determine if it should be enabled. Before I discuss the details, let's discuss what Dynamics GP Activity Tracking can, and cannot, provide. Activity Tracking can provide basic logging of basic Dynamics GP security events. A user logged in successfully, or unsuccessfully. A user opened a window. A user logged off. It can also track when a window was successfully opened, or when a user failed to open a window. And also when a user creates, modifies, or deletes a master record or transaction, or even when a user prints a report. And finally, the tracking can tell you when a user posted a specific type of batch. On the surface, this sounds pretty nice, and sounds fairly comprehensive. However, before you go and turn on all sorts of Activity Tracking, you will want to ask yourself a few questions. 1) Why do you want to turn on activity tracking? Do you have a specific reason or scenario that the tracking will help address? 2) If you enable tracking, does the data collected specifically answer the questions that you will have? 3) How much effort are you willing to dedicate to managing and analyzing the tracking information?